Vegas has so many faces. Literally. There are faces on billboards, handbills, taxi cabs and marques. For many of the tourists that come to town some are more recognizable than others. Take Carrot Top. When he walked into the T Spot lounge at the Tuscany Resort Casino on Tuesday night (where a handful of us had stopped by after celebrating my son’s graduation from UNLV in a banquet room upstairs) my son and his close friends were agog. In classic Carrot Top fashion, the celebrity comedian gave each of the enthused partiers a hug and a bit of conversation before being swallowed up in the crowd of fans and friends who were there for the Zowie Bowie show. In classic “mom” fashion, I decided that a photo op would be a treasure to be remembered for the celebrants. 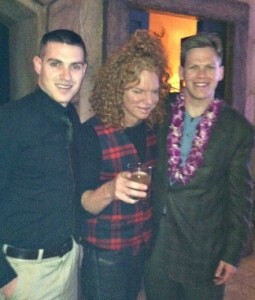 Carrot Top, whose real name is Scott Thompson, not only willingly obliged for the graduate and his close friend who is a young veteran, he suggested we step outside the club for a more personal photo, then he invited the whole party to be his guests at his show at the Luxor the following night. Seated in prime seats in the middle of the fifth row, the gang was positively delighted with Carrot Tops’ rapid fire delivery as he went through his inventory of custom props that pretty well sum up topical issues and the idiosyncrasies we all have to deal with in life. Celebrities get pilloried with and without some very intriguing and sometimes devious devices and visual aids. The skit about trying to find your room in a casino hotel is a pure delight—and so goes the show. Fast-paced delivery, a really good soundtrack, twinkling blue eyes, and a mop of red-hair makes Carrot Top’s show endearing. He can get away with pushing certain envelopes (which I think he does just to make sure the audience is really on their toes) without being coarse and vulgar. He’s clever and that’s an art in itself.